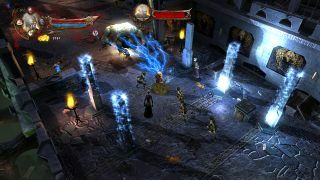 Something's amiss in Wizarbox's action-RPG Realms of Ancient War. It's got slashing swords and magical mayhem galore, but what's needed is the evil-vanquishing power of friendship . Publisher Focus Home released a trailer today showcasing War's 2-player co-op support - if you've the stomach of steel to push past the spastic camera movements, you'll find a potentially entertaining monster genocide awaiting you and your buddy. And remember: loot creates compromise, not conflict. Now give me that gauntlet. Realms of Ancient War releases October 4.